Luxury in a recession. 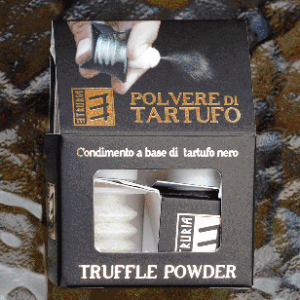 Black truffle powder in an easy to dispense pack. A modern and practical way to flavour your food. Sprinkle and mix the truffle powder on hot food, eggs, pasta, rice, potatoes meat or toasted bread. One puff is enough! Italian Black Truffle Powder is freeze-dried, ground ‘Tuber Aestivum’ Black Truffles. A truffle is the fruiting body of an underground mushroom; spore dispersal is accomplished through fungivores animals that eat fungi. Almost all truffles are ectomycorrhizal and are therefore usually found in close association with trees. There are hundreds of species of truffles that are big, but the fruiting body of some (mostly in the genus ‘Tuber’) are highly prized as a food. The 18th-century French gastronome Brillat-Savarin called these truffles “the diamond of the kitchen”. Edible truffles are held in high esteem in French, Spanish, northern Italian and Greek cooking, as well as in international Cuisine. The origin of the word truffle appears to be the Latin term tuber, meaning “swelling” or “lump”, which became tufer- and gave rise to the various European terms: French truffe, Spanish trufa, German Trüffel, Dutch truffel and Croatian tartuf. In Portugese, the words trufa and túbera are synonyms, the latter closer to the Latin term. The German word Kartoffel(“potato”) is derived from the Italian tartufo (truffle) because of superficial similarities. The mycelia of truffles form symbiotic relationships with the roots of several tree species including beech, poplar, oak, birch, hornbeam, hazel, and pine. They prefer argillaceous or calcareous soils which are well drained and neutral or alkaline. Truffles fruit throughout the year, depending on the species and can be found buried between the leaf litter and the soil.